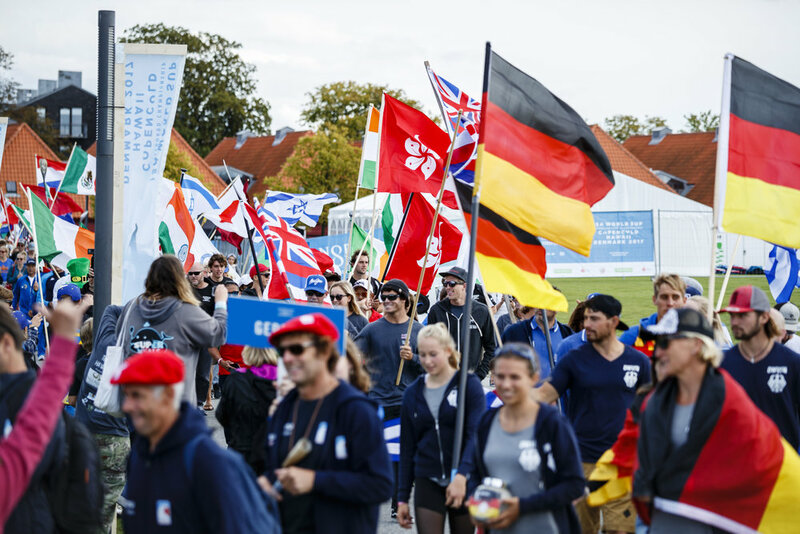 A record-breaking 280 SUP and Paddleboard athletes from 42 nations have arrived in Denmark to represent their nations and go for Gold in a historic edition of the 2017 ISA World SUP and Paddleboard Championship. 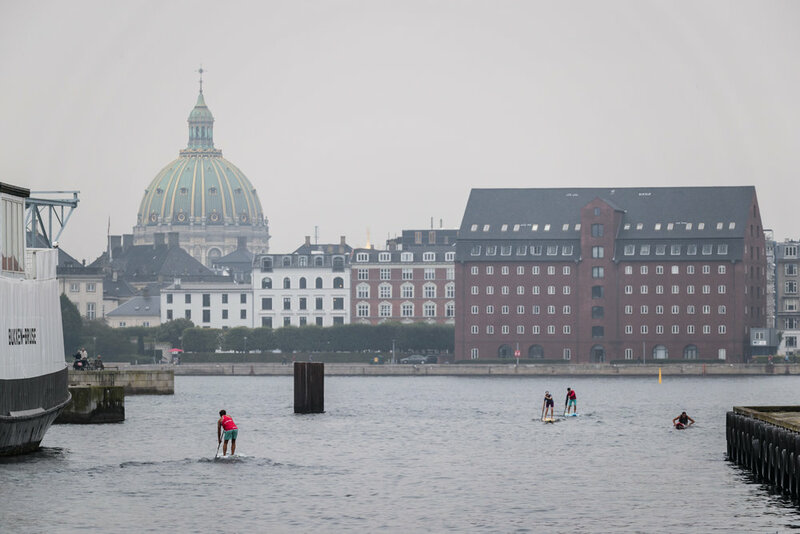 SUP and Paddleboard Racers warm up in Copenhagen Harbor for the Distance and Sprint Races to come on Saturday and Sunday. As the sole World Championship for the sports of SUP, the participation for the 2017 edition in Denmark has reached unprecedented levels. Athlete participation has increased by more than 100% from the 2016 edition and fifteen more nations than the record of 27 will be vying for the coveted Club Waikiki-Peru World Team Champion Trophy awarded to the Team Gold Medalist. Team Australia has arrived in Denmark intent on continuing their dominance in the World Championship, having earned the Team Gold Medal in four of the event’s five editions. Bulgaria, Channel Islands, Czech Republic, Ecuador, Finland, Greece, Hong Kong, Hungary, Israel, Morocco, Poland, Russia, and Wales are the first-time competing nations that have confirmed their participation in Denmark, demonstrating the expanding reach and growth of all SUP disciplines across the world. To see the full list of participating teams, click here. “The world-wide growth and development that SUP has experienced under ISA leadership is amazing,” said ISA President, Fernando Aguerre. “Since the inaugural year of the ISA World SUP and Paddleboard Championship in 2012, the athlete participation has nearly tripled and competing countries have doubled. “As the fastest growing water sport in the world infused with youthful, high performance qualities, SUP would be a perfect fit on the Sports Program of the Olympic Games. The ISA has successfully included SUP in the 2019 Pan Am Games, the 2019 World Beach Games, and the 2017 Central Americans Games, and we intend to continue driving the development and growth of the sport until SUP arrives where it belongs on the world’s greatest sporting stage. Notably, Team India, one of the inspiring stories that came out of the 2016 Fiji ISA World SUP and Paddleboard Championship, their first ISA event in history, will return again to compete in 2017 and build on their great strides of growth. Sekar Patchai and Tanvi Jagadish will proudly fly the Indian flag and push the limits of the sport in their country. 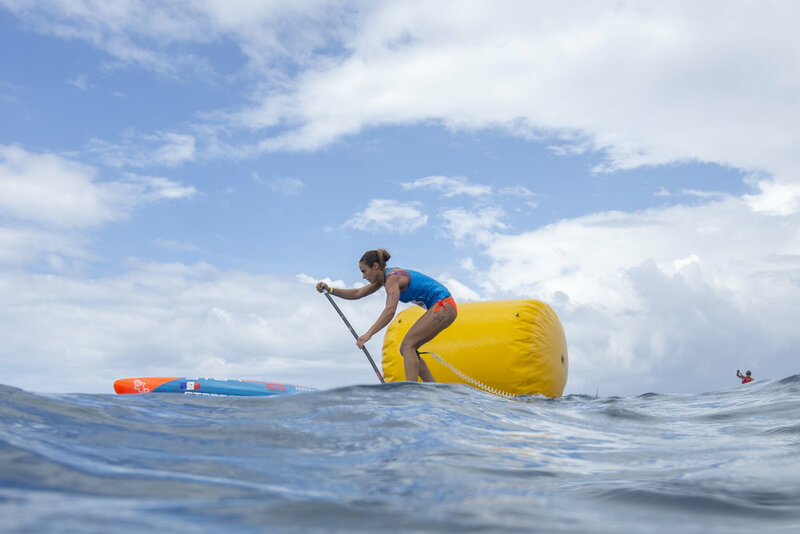 “The 2016 ISA World SUP and Paddleboard Championship was my first time at an international competition, and I didn’t know a whole lot about elite equipment, such as what paddle and board to use,” said Tanvi Jagadish. “I’ve learned so much since then and this year my goal is to finish in the top ten of my races. The Opening Ceremony will kick off the festivities on September 1 at 2pm CEST featuring the Parade of Nations and Sands of the World Ceremony in Copenhagen. All 42 nations will parade through the city to the Opening Ceremony stage located in front of the iconic Copenhagen Opera House. The procession will continue with the Sands of the World Ceremony, where each team pours sand from their country into a container, symbolizing the peaceful gathering of nations of the world through SUP. 2017 set to go down in history as the biggest edition of the event to date. The 2017 ISA World SUP and Paddleboard Championship, taking place in Denmark from September 1-10, is set to gather the world’s top SUP surfers, SUP racers, and paddleboarders for a historic edition of the event, the first to ever take place in Europe. The 2017 edition of the World Championship is on pace to be the biggest in the event’s six-year history, as more than 250 athletes from up to 40 nations across all five continents will take to the water in search of Gold Medals. Numerous past ISA Gold Medalists have enlisted to compete in the World Championship, including Denmark’s Casper Steinfath (SUP Technical & Sprint Races), Hawaii’s Connor Baxter (SUP Technical, Distance, & Sprint Races), Hawaii’s Zane Schweitzer (SUP Surfing), USA’s Candice Appleby (SUP Technical & Distance Races), and Australia’s Jordan Mercer (Paddleboard). Mercer, the most decorated ISA athlete of all time with eight individual Gold Medals, will make a return to the event after missing the 2016 edition in Fiji due to injury. Mercer will form part of a formidable Australian squad looking to win their fifth Team Gold Medal in the event’s sixth edition and defend their World Champion Title earned in 2016. Returning Gold Medalists joining Mercer on Team Australia will be Michael Booth (SUP Distance Race), Shakira Westdorp (SUP Surfing), and Lachie Lansdown (Paddleboard). Team France put on a strong showing in 2016 and made their first podium finish in the history of the event, earning the Silver Medal. 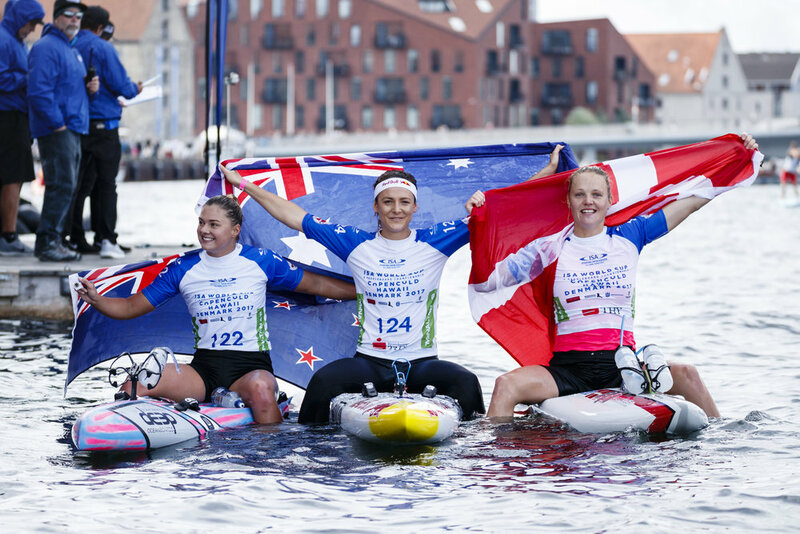 The French will head to Denmark packing a punch again in 2017, led by a strong SUP racing contingent of Titouan Puyo, Arthur Arutkin, and Olivia Piana who have their eye on dethroning Australia for France’s first team Gold Medal. Causing great excitement and expectation among the Danish spectators will be the local standout SUP racer, Casper Steinfath. The ISA Vice President and four-time Gold Medalist (3x Technical Race, 1x Sprint Race) at just 23 years of age has asserted himself as one of the top SUP racers in the world and will attempt to earn medals for the host nation. Additionally, New Zealand’s Penelope Armstrong, who courageously competed and won the Women’s Technical Race Gold Medal in 2016 after overcoming Ovarian Cancer, will return to defend her title in Denmark. To see the full rosters of teams that have registered thus far, click here. “2017 is shaping up to be a historic edition of the ISA World SUP and Paddleboard Championship, as the world’s top athletes will compete in record numbers in Denmark. “The participation of the elite athletes of SUP racing, SUP surfing, and Paddleboard speaks to the international prestige that this event holds and the ISA’s commitment and leadership in developing the sport. The 2017 ISA World SUP and Paddleboard Championship will take place in two scenic locations across the Scandinavian nation. The event will kick off on September 1-3 with the Distance and Sprint Races in the picturesque canals of Copenhagen, then on September 4 it will head to the rugged northwest coast to Vorupør, known as Cold Hawaii, for the Technical Races, SUP Surfing, and Relay Races. The event will culminate with the Closing Ceremony in Vorupør on September 10. 2017 will be the sixth edition of the event after previous editions were held in Peru (2012, 2013), Nicaragua (2014), Mexico (2015), and Fiji (2016). To see the full event schedule, click here. The 2017 ISA World SUP and Paddleboard Championship is set to take place from September 1-10 in Denmark, marking a historic gathering of the world's best SUP racers, SUP surfers, and Paddleboarders in an edition of the event that is set to break participation records. Find all the things you need to know about COPENCOLD HAWAII - here. The event will take place at two locations across Denmark that contrast the different types of beauty that the country has to offer. The competition will kick off in the metropolitan, coastal port of Copenhagen, and then head to the quaint fishing village of Vorupør, located on Denmark's northwest coast, also known as Cold Hawaii. The picturesque canals of Copenhagen will host the Distance and Sprint Races, while Vorupør will host the SUP Surfing, Technical Races, and Team Relay Race. To see the Copenhagen race courses, click here. To see the courses in Vorupør, click here. The World Championship will be streamed live on the ISA website from September 1-10. Visit the official event website for results, photos, videos and news pertaining to the competition. Fans will also be able to watch the live webcast on the ISA's Facebook page. Through development programs, scholarships for young SUP athletes, and promoting Championships at the national level, SUP has experienced explosive growth under the ISA's guidance, which can be observed in the participation levels seen in the World Championship that have nearly quadrupled since its inception. The ISA presented both Surfing and SUP to the Tokyo 2020 Organizing Committee for inclusion in the Olympic Sports Program. Tokyo 2020 only elected Surfing to be included in the Games and not SUP, however achievements such as inclusion in the 2019 Pan American Games, 2019 World Beach Games, and 2017 Central American Games have added momentum to the ISA's push for inclusion in the 2024 Olympics. The 2017 ISA World SUP and Paddleboard Championship will feature gender equality across all divisions, reflective of the rapid growth of women's SUP racing and surfing. ISA Vice President and 3x Technical Race Gold Medalist, Casper Steinfath, will represent Team Denmark in the Men's SUP Technical and Sprint Races, looking to earn a Gold Medal for the local crowd. International Surfing Association Facebook page (@ISAsurfing), Instagram (@ISAsurfing), Twitter (@ISAsurfing), Youtube (ISAsurfing) and Snapchat: ISA_Surfing. Put on in conjunction by the ISA's National Federation in Denmark, the Danish Surfing and Rafting Federation, and Copencold Hawaii, the SUP Crossing is a festivity to celebrate and promote the participation of SUP in Copenhagen. 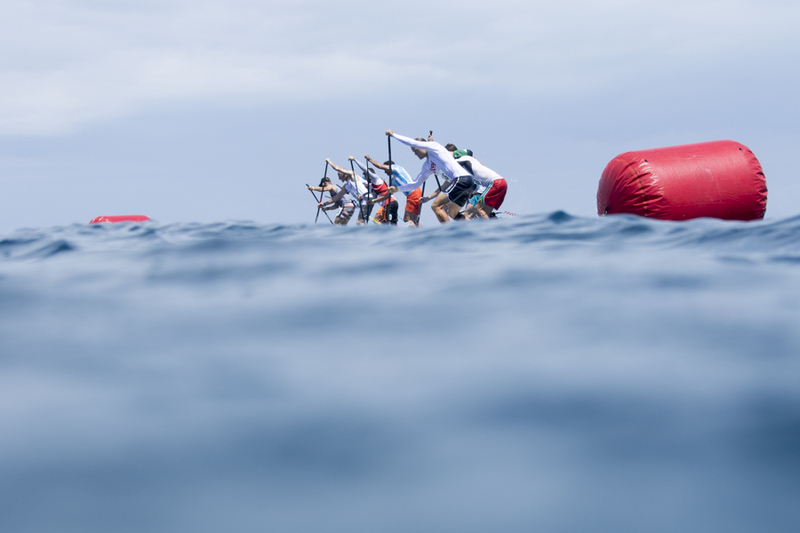 The festivity's events include a film festival, music, and the main event, four different SUP courses with varying difficulty for all levels of SUP racers. Recognized by the IOC as the world governing body for Surfing and SUP, the ISA's mission is to create a better world through development of these sports. This is accomplished through annual World Championships for surfers representing their countries, membership development, educational programs, scholarship distribution, preparing for Surfing's participation in the Olympic Games, and promotion of the inclusion of SUP in future editions of the Games. The International Surfing Association (ISA) has hailed the unique Surfing and StandUp Paddle locations Denmark has to offer following site visits to both Copenhagen and Vorupør, co-hosts of the 2017 ISA World StandUp Paddle (SUP) and Paddleboard Championship. The ISA welcomed the preparation and progress of the Championship whilst attending the 2017 SportAccord Convention in Aarhus, Denmark. Copenhagen Harbour, during the Danish Standup Paddle Championship 2014. Vorupør, situated in the northwest coast of the country in an area known as “Cold Hawaii”, was confirmed as the SUP Surfing and Technical Race location thanks to its excellent wave conditions, its transport infrastructure and its accommodation capacity. The SUP Racing events will be held on the iconic canals of the Danish Capital right in front the Copenhagen Opera House. SUP is a core discipline of the ISA and recreationally it is one of the world’s fastest growing watersports. SUP was part of the ISA’s submission for Olympic inclusion at Tokyo 2020 and ensuring the popular discipline becomes part of the Olympic Programme in future remains a key part of the ISA’s strategy. ”The global development and promotion of SUP is a big priority for the ISA and we are excited to continue to build this event and discipline with the help of our Danish partners. Vorupør and Copenhagen are fantatic locations for 2017 ISA World StandUp Paddle and Paddleboard Championship and we are confident that the excellent conditions will provide the world’s best SUP Surfers and Racers the perfect stage to showcase their amazing skills. The International Surfing Association (ISA) has today announced that the 2017 ISA World StandUp Paddle (SUP) and Paddleboard Championship will be held in Denmark in September 2017, with the specific dates to be confirmed in the near future. Finn Jorsal (left), president of Friends of Cold Hawaii, and Robert Fasulo (right), executive director, ISA, and Casper Steinfath (middle), ISA and Cold Hawaii, in the Danish National House in Rio, after signing the COPENCOLD HAWAII – ISA World StandUp Paddle and Paddleboard Championship 2017 hosting agreement. The ISA event will be organised by Friends of Cold Hawaii, an association that hosts annual ocean sport championships in Denmark, in collaboration with the Danish Surf and Rafting Federation (DSRF), Sportevent Denmark, Wonderful Copenhagen and Copenhagen Watersports – the largest rafting and StandUp Paddle club in Denmark. Finn Jorsal (left), president of Friends of Cold Hawaii, and Robert Fasulo (right), executive director, ISA, in the Danish National House in Rio, signing the COPENCOLD HAWAII – ISA World StandUp Paddle and Paddleboard Championship 2017 hosting agreement. Today’s announcement was made at Danish National House, a hospitality venue at the Rio 2016 Olympic Games, located on Ipanema Beach. The signing of the hosting agreement was completed by ISA Executive Director, Robert Fasulo and President of the Local Organising Committee Friends of Cold Hawaii, Finn Jorsal. The ISA World Championship will be a dual location event, with the SUP and Paddleboard Racing taking place in Copenhagen, the country’s capital, and the SUP Surfing in Cold Hawaii – a prime Surfing location on Denmark’s Northwest coast. The announcement of the 2017 ISA World SUP and Paddleboard Championship comes on the back of the confirmation of the 2016 edition, which will be held in the world-renowned waves of Cloudbreak, Fiji from 12-20 November 2016. Joining the ISA World Championship Series in 2012 in Peru, the ISA World SUP and Paddleboard Championship has become the fastest growing event in the series. At the 2015 edition, participation more than doubled since the event’s inception in 2012 with 27 Nations and 260 athletes converging on the shores of Sayulita, Mexico for an incredible week of competition that resulted in Team USA earning their first-ever Gold Medal. Finn Jorsal (left), president of Friends of Cold Hawaii, speaking in the Danish National House in Rio before the signing of the COPENCOLD HAWAII – ISA World StandUp Paddle and Paddleboard Championship 2017 hosting agreement. To the right: Robert Fasulo, executive director, ISA. “We are delighted to bring our 2017 ISA World SUP and Paddleboard Championship to Denmark, and for the first time to Europe. We are excited to partner with our friends from Denmark whose commitment and enthusiasm for SUP is a testimony to the global growth and development of this key ISA discipline. With our 2016 Championship in Fiji this November followed by Denmark next year, SUP and Paddleboard are becoming more and more universal. “As the world governing authority for SUP and Paddleboard, we are working every day to foster the worldwide development and growth of these disciplines. 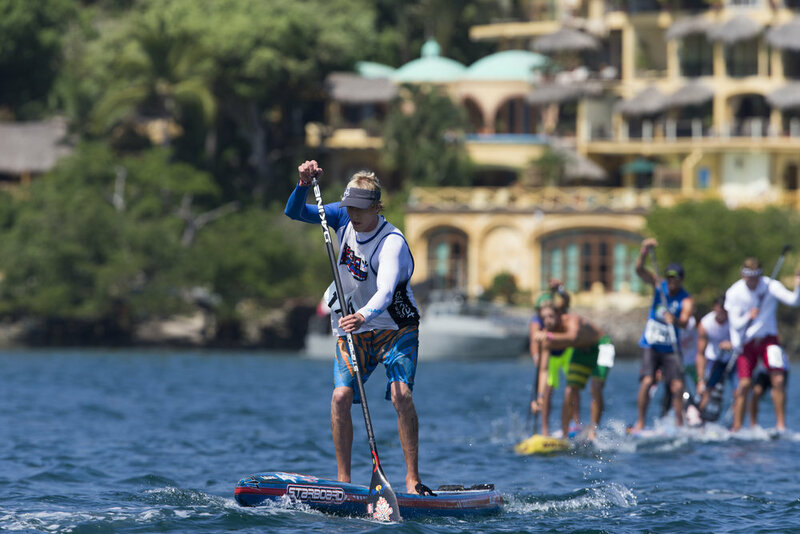 Following the inclusion of SUP Racing and SUP Surfing in the 2019 Pan Am Games in Lima, bringing this competition to Denmark and Europe will provide another outstanding platform to showcase the elite athletes competing in a world-class event, raising the global profile of the sport. From left Christina Fontoura, Poul Erik Bligaard, trade commissioner, Ministry of Foreign Affairs of Denmark, Laudemar Aguiar, Rio's head of international relations, Finn Jorsal, president of Friends of Cold Hawaii, and Robert Fasulo, executive director, ISA, toasting at the Danish National House in Rio.